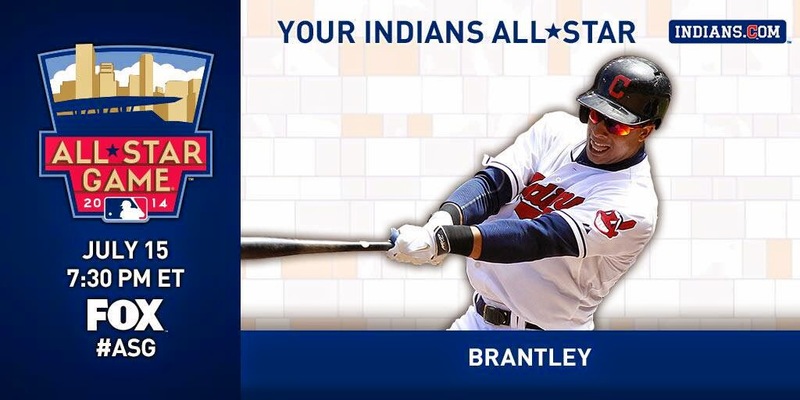 All Things Brantley, All Things Tribe: Brantley Made the American League All Star Team! for the first time in his career, Michael Brantley is an All Star! he is headed to Target Field in Minneapolis, Minnesota for the 85th annual All Star game on July 15, 2014! after Michael learned about his being named to the All Star team, he said, "it's great. i don't know if you can put it in one sentence or what words to describe this. it's an awesome feeling. a lot of credit goes to my teammates. and yeah, it's a great feeling." Michael on being nominated by fellow players: "it means a lot to me. just how i play the game, i respect the game. just playing hard each and every day. they voted for me to make this appearance and my hats go off to them. i thank them. i thank my teammates, the Cleveland Indians for giving me this opportunity, my family, and everybody else that took the steps to get me here. it's a privilege, it's a blessing, it's an honor." when asked if he thought the All Star game would be a possibility, he said, "i can't think about that stuff. that's a distraction to me. now that it's happened, i'm very fortunate, very lucky, and very excited about the opportunity." he plans to pick the brains of the other players at the All Star game and enjoy every opportunity he has. "you never know when it's going to happen again. to have this happen now for me, words can't describe how happy i am inside and how blessed i am. i just want to make sure that i enjoy waking up early in the morning until i go back to sleep, and just keeping my eyes open to all the great experiences." does it make it extra special knowing all his teammates voted for him? "no doubt about it. i can't thank them enough because they're the reason why i'm here. yeah i do some things on the field but without them this is not possible. so i gotta thank them the most, along with my family for the support. and it's a privilege, it really is." the only person he told immediately after finding out he made the team was his wife. but he may be most excited to tell his father the happy news. "i look forward to calling my father, and i want to talk to my mother, and my sister, and just make sure i call them first so they can experience this with me. i'm excited to see his reaction. i can't wait to just talk to him and see what he has to say. we haven't talked about it at all. for me to have the opportunity to have a phone call and tell him, that's going to be something very special and something i'll never forget." Terry Francona, part of this year's American League team coaching staff said, "i think it means a lot that the players voted for him. that shows the respect he has and it's growing throughout our league." Cody Allen believes "every pitcher in the league probably doesn't like facing Brantley, so i'm sure he got a lot of votes from pitchers." Corey Kluber said, "i think you ask every single person in our locker room, if there's one person they want to represent our team, it's Brantley. the way he plays, the teammate he is, he's a guy that's deserving as anybody in the league." he's a perfect 10-for-10 in stolen bases, also tops on the club. he's tied for 2nd with 20 doubles and 3rd with 29 walks. he has only 30 strikeouts among all the regular players. Michael currently ranks 4th in batting average, 5th in OBP, 7th in hits, 9th in OPS, tied for 3rd in runs, and tied for 9th in RBI compared with the rest of the American League. among American League outfielders, Michael is 1st in batting average, 3rd in RBI, 3rd in OBP, 4th in SLG, 4th in OPS, 4th in hits, 5th in total bases, 6th in extra base hits, 6th in doubles, and 7th in home runs. in the race for the batting title, Michael ranks 8th. defensively, he's tied for the major league lead with 10 outfield assists. he is on pace to set career highs in just about every important category there is in baseball. had he not been chosen for this year's ASG, i would have been sure that the fix was in. but Michael earned this honor and was rightfully rewarded. he's been through a lot, and he's never complained. he always puts the team first. he's very respectful and plays the game the right way. combine all that with his stats, and Michael is the ultimate definition of an All Star. and in honor of this special occasion, i decided to look back through Michael's career, to see where he came from and how he got here. 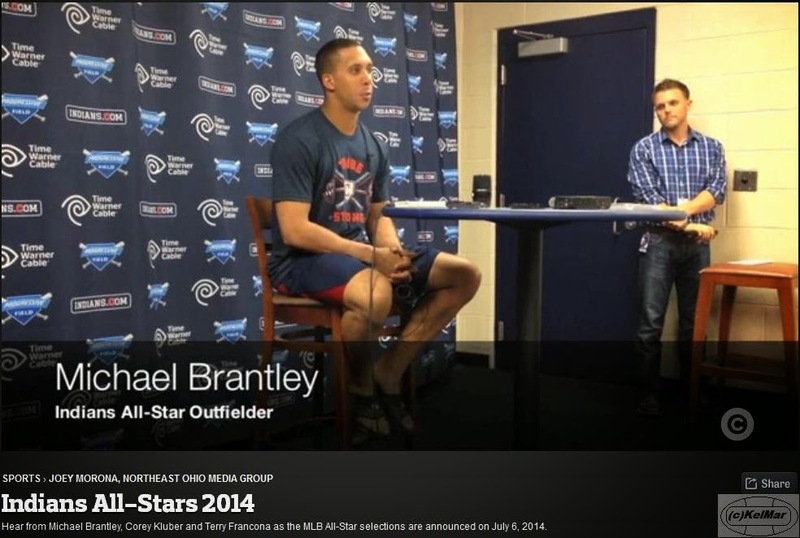 if you're interested in that, you can read my Brantley retrospective blog here. disclaimer: thanks to Jordan Bastian for providing some of the Michael quotes i used here.